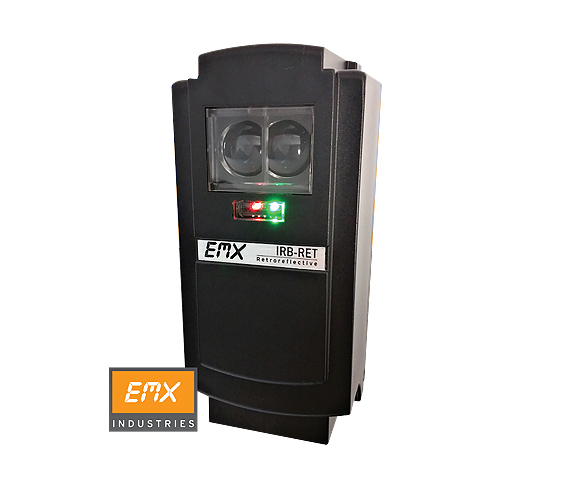 Get the EMX IRB-RET specifications and installation/owners manual pdfs by clicking the download buttons. The IRB-RET provides a universal solution for entrapment protection. One photoeye covers the entire spectrum of possible requirements for monitored and non-monitored photoeyes, simplifying inventory management and product training. The IRB-RET is an external entrapment protection device type B1, non-contact sensor for use with automatic gates and doors. The device is a UL325-2018 recognized component suitable for use with both operators that require monitored entrapment protection and those that do not require monitored operation. 5. Resistive termination: Provides a 10k Ohm resistance when unobstructed. The IRB-RET is a monitored, weather-proof retroreflective photoeye solution providing entrapment protection for automatic gates and doors. Retroreflective configuration eliminates the need for a separate transmitter and the associated wiring across a roadway to reduce installation costs. The IRB-RET is UL 325-2018 compliant and housed in a rugged NEMA 4X enclosure suitable for indoor and outdoor use.